– Preheat the oven at 200 Celsius and put the kettle on. – Fry marinated chicken breast in medium hot pan approx 1-2 minute on each side. – Transfer the chicken on the baking tray to cook in oven for approx 12-15 minutes. – Put chopped garlic in the same pan which you just fried the chicken ( no need to wash). Turn the gas hob to high heat. Then throw in the prawns, fish sauce, sugar. Flash fry until the prawns “just” cooked. Then take of the heat. – Pour hot water in a large bowl. Soak rice paper in warm water until it soften and translucent ( usually about 10 seconds) Soak and make the roll one at a time. – Gently take the rice paper out from water and lay it on a clean flat surface, then lay lettuce leaf, spring onion, cucumber, 3 mint leafs and 4 prawns on the rice paper. 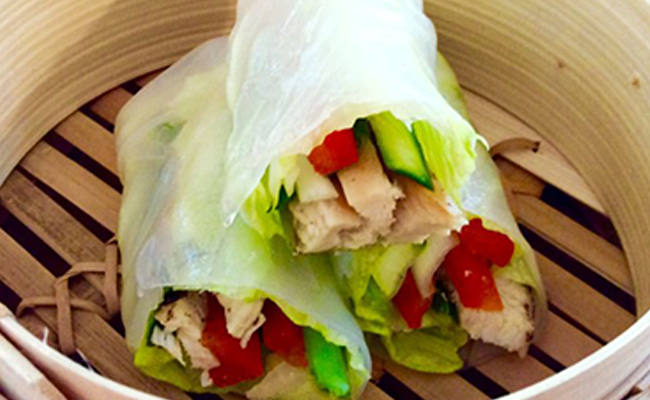 – Fold and roll the rice paper as how you like to be served. You should be able to make 2 prawns rolls. – Took the chicken out of the oven and sliced thinly. – Repeat the same method as the prawns rolls. You should be able to make 3 chicken rolls from this recipe. – Again, on the same pan which you just cooked the prawn( no need to wash) in goes 2tbs of water and heat the leftover. The will be your garlic sauce. It should have slight thick consistency. Spoon the sticky garlic sauce on top of the rolls. 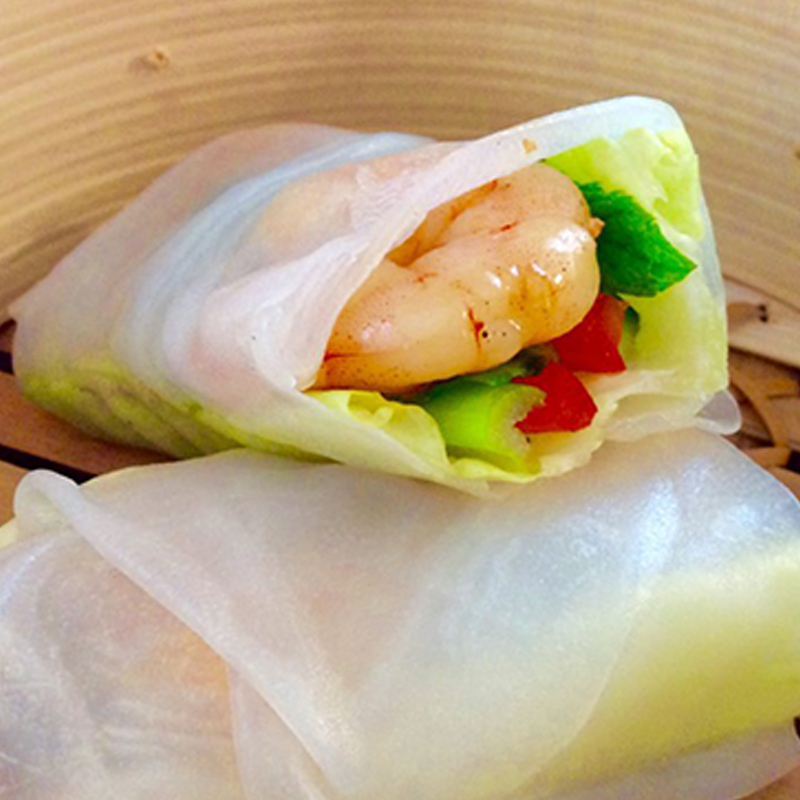 – Enjoy the freshness of Garlic Prawns/Chicken In Rice Paper with sweet chilli sauce or soy sauce. You can buy the rice paper in oriental supermarket near you. It’s likely to be in Vietnamese food section. Be patient while making the roll as it’s a delicate ingredient.